The weekend of Sep 15th we headed to Huntsville for a weekend vacation! We started out by visiting the Dinosaur Park in Ogden! It was pretty awesome. 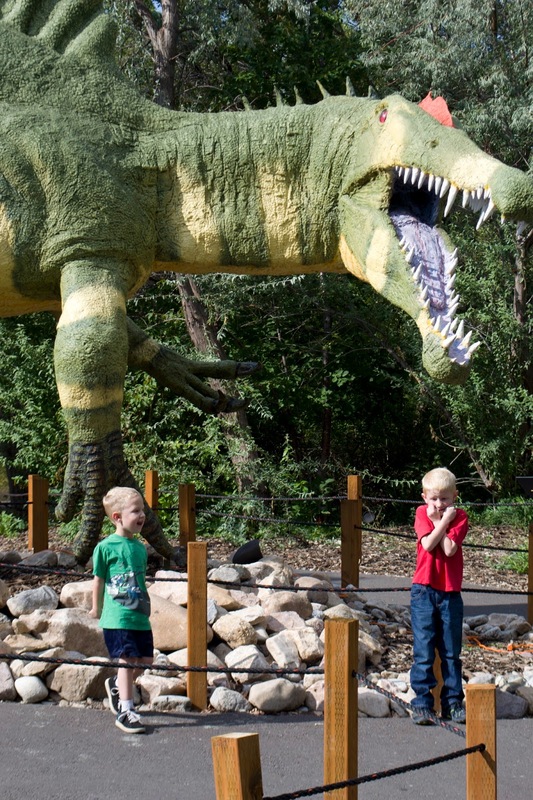 They have life size dinosaurs outside and dino bones inside. We met Papa Bill and Grandma Linda as well as our friend Rikelle and her kids. Logan was a ham! 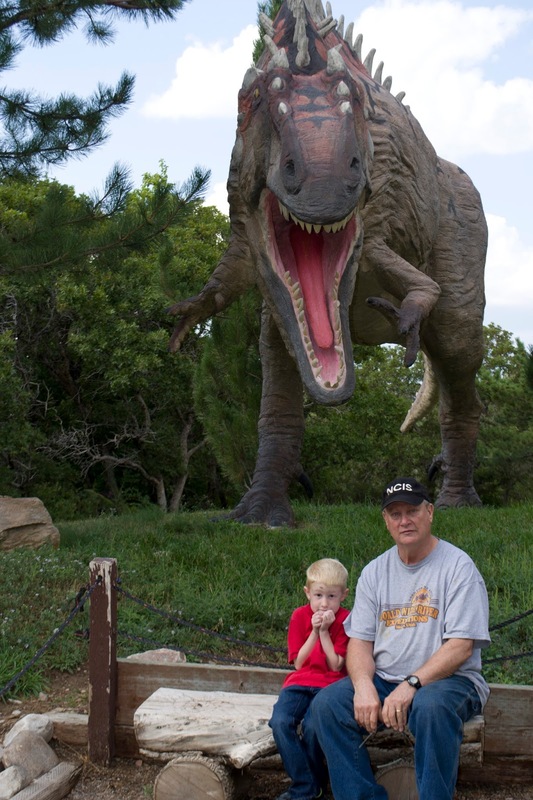 He loved to pose with the bones and dinosaurs and exclaim "TAKE A PICTURE!!!" Help! It's going to eat his head!!! The playground was probably the favorite part of the park because they got to climb on dinosaurs. It was fun to explore with Edison and Jovie. Dustin was extremely camera shy as well as scared of the dinosaurs. But he had a good time too!. Each dinosaur had a sign telling you about the dinosaur. I had a lot of fun reading about them and learning more. They also had a place where you could dig up fossils! The kids had a blast discovering new dinosaurs! 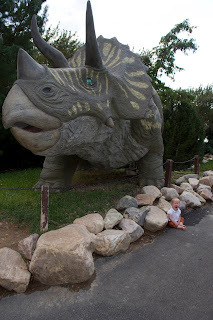 After the Dinosaur park we headed to McDonalds for dinner and the play place and then went on to the Bed and Breakfast we reserved for the night. It was pretty neat, they had converted a barn into a hotel. Our room had an upstairs with a queen bed, couch and chairs (and we brought a pack n play to put Brooklyn in), spiral staircase leading to the bedroom, kitchen table, and bathroom. Dave was a huge fan and wants to stay in more places like that in the future instead of the hotels I usually book. The next day Dave woke up early and ran the Huntsville Marathon! He hadn't been training as hard as he should have and ended up injuring himself. But he finished! We were so proud of him! The boys also competed in their first race too! It was about a mile long but they got tired about .25 miles in and wanted to head back to watching for Dave. Usually I would have pushed for them to complete it, but since we weren't sure when Dave would cross, I let them call it good. A quarter of a mile isn't to shabby for 3 and 6. This little munchkin has been getting into everything!!! She loves to empty out anything and everything she can get her hands on. And it's more than ever since she has learned how to walk! Dave was so excited to get to see her take her first steps without me. We're so proud of her. Maybe she will grow hair next.